At the University of Texas at El Paso, or UTEP, nearly a thousand students live in El Paso's city sister, Juárez, and commute across the border to school. Lately, that hasn't been easy. "Before all of the chaos happened with the border it took me around 20 minutes to an hour, depending on the day and the hour," says Carlos Medina, a psychology major. "But now it takes me from three to five hours." Medina sits in a coffee shop on campus, studying with friend and fellow border crosser Alejandra Salcido. She says the increased wait times and constant uncertainty are incredibly stressful. She even has a plan for what to do if the border gets shut down. "I actually have clothes in my car in case I have to stay here," she says. "I have an uncle here so I can stay there. And the thing is that my son is in Juárez so in case I have to stay here, he has to stay there. So we'll be separated." Salcido tears up at the prospect of spending time away from her 4-year-old. "One of the things that's really special about this region of the country is we often don't see ourselves as two different countries," says Catie McCorry-Andalis, the Dean of Students at UTEP. "We see ourselves very much as one community. And times like these is when we're reminded of 'Oh, there are two different countries here.' But that's not how we operate." The university is taking steps to support students and staff who live in Juárez, by offering temporary housing on campus and virtual counseling services. A newly launched website includes resources for border crossers and updates on the ports of entry. "You know, a lot of this is the fear of the unknown," McCorry-Andalis says. "We just don't know what's gonna happen. So it's really making sure we have a plan regardless of what happens and make sure they're successful." The impact extends far beyond the university. Nearly $1 billion in trade crosses the U.S.-Mexico border every day, much of it through El Paso. Jon Barela is CEO of the Borderplex Alliance, an economic development nonprofit serving Juárez, El Paso and Las Cruces, N.M. "Shutting the bridges, closing the ports, all of those, even threats of doing so would have an absolutely devastating impact and would immediately cost the American economy tens of millions of dollars," he says. Barela says the borderplex region depends on cross-border trade. Between 15 and 30 percent of retail trade alone comes from Mexican nationals, who cross the border to shop or eat. But the rest of the country relies on that trade, too. "We're seeing reports of cargo trucks that are carrying goods that are very important to our manufacturing supply chain in the U.S. experiencing wait times of 12 hours and more," Barela says. "And that cannot continue for much longer before you start seeing some very negative economic impacts in the United States." On a recent morning, lines of commercial and passenger vehicles stretched far into the distance on the Mexican side of the international Bridge of the Americas. 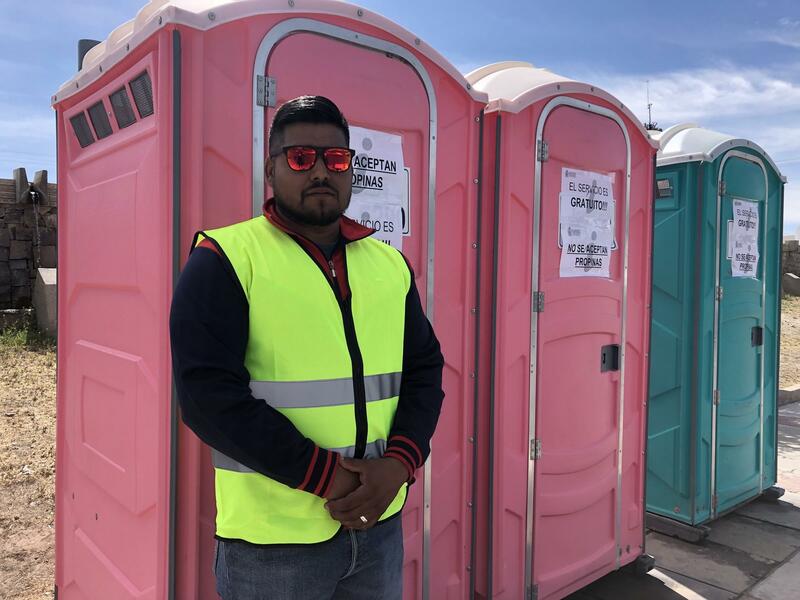 The lines have become so long, the mayor of Juárez set up port-a-potties. Victor Santana mans a foldout table with hand sanitizer and a large ream of toilet paper. "We're providing free bathroom services," he says, "because the wait time in line goes past four hours." Juan Manuel Chavez sat in his stalled cargo truck as breeze rushed in through an open window. He said he'd been in line for more than six hours, since 4:30 that morning. The wait was even longer the day before, he said. He wanted to make two delivery trips across the border, but that just wasn't possible. And that, he says, has an economic impact. People cross the U.S.-Mexico border daily for work and school. We're going to go now to El Paso, where President Trump's threats to shut down the border earlier this week created anxiety and uncertainty among many residents. Mallory Falk has this report from El Paso. MALLORY FALK, BYLINE: Step onto the campus at the University of Texas, El Paso, known as UTEP, and it doesn't take long to find students who live in El Paso's sister city Juarez and commute across the border to school like these two study buddies. CARLOS MEDINA: My name is Carlos Medina. ALEJANDRA SALCIDO: My name is Alejandra Salcido. FALK: They sit in a campus coffee shop prepping for an exam. Like nearly 1,000 other students here, Medina and Salcido have to cross an international bridge to get to class. Lately, that hasn't been easy. MEDINA: Before all of the chaos happened with our border, it took me around 20 minutes to an hour depending on the day and the hour. But now it takes me from three to five hours. FALK: Hundreds of Customs and Border Protection officials have been reassigned from their usual posts at ports of entry to help with the migrant families crossing the border in growing numbers. That's led to longer and more unpredictable wait times on the bridges. Salcido says it's all incredibly stressful. She even has a plan for what to do if the border gets shut down. SALCIDO: I actually have clothes in my car in case I have to stay here. But I have an uncle here, so I can stay there. And the thing is that my son is in Juarez, so in case I have to stay here, he has to stay there, so we'll be separated. FALK: She tears up at the prospect of spending time away from her 4-year-old. CATIE MCCORRY-ANDALIS: You know, one of the things that's really special about this region of the country is we often don't see ourselves as two different countries. FALK: Catie McCorry-Andalis is the dean of students at UTEP. MCCORRY-ANDALIS: You know, a lot of this is the fear of the unknown. We just don't know what's going to happen. FALK: The university is taking steps to support students and staff who live in Juarez like offering temporary housing on campus and virtual counselling services. There is a newly launched website with resources for border crossers and updates on the ports of entry. The impact extends far beyond the university. Nearly $1 billion in trade crosses the U.S.-Mexico border every day, much of it through El Paso. JON BARELA: Shutting the bridges, closing the ports - all of those - even threats of doing so would have an absolutely devastating impact and would immediately cost the American economy tens of millions of dollars. FALK: Jon Barela heads the Borderplex Alliance, an economic development nonprofit serving Juarez, El Paso and Las Cruces, N.M. He says this region depends on cross-border trade. Between 15 and 30 percent of retail trade alone comes from Mexican nationals who cross the border to go shopping or out to eat. But the rest of the country relies on that trade, too. FALK: On the Mexican side of the Bridge of the Americas, lines of cars stretch far into the distance. The lines are so long the Mexican government set up port-a-potties. Victor Santana mans a fold-out table with hand sanitizer and a large ream of toilet paper. FALK: We're providing free bathroom services, he says, because the wait time goes past four hours. Juan Manuel Sanchez (ph) sits in his stalled cargo truck, breeze rushing in through an open window. He's been here since 4:30 in the morning, he says - more than six hours. JUAN MANUEL SANCHEZ: (Speaking Spanish). FALK: He says the wait was even longer yesterday. He wanted to make two delivery trips across the border, but that just wasn't possible. And that, he says, has an economic impact. For NPR News, I'm Mallory Falk in El Paso. Transcript provided by NPR, Copyright NPR.